In the nineteenth century, richly-drawn social fiction became one of England’s major cultural exports. At the same time, a surprising companion came to stand alongside the novel as a key embodiment of British identity: the domesticated pet. In works by authors from the Brontës to Eliot, from Dickens to Hardy, animals appeared as markers of domestic coziness and familial kindness. Yet for all their supposed significance, the animals in nineteenth-century fiction were never granted the same fullness of character or consciousness as their human masters: they remain secondary figures. 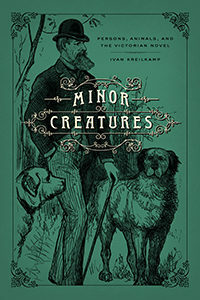 Minor Creatures re-examines a slew of literary classics to show how Victorian notions of domesticity, sympathy, and individuality were shaped in response to the burgeoning pet class. The presence of beloved animals in the home led to a number of welfare-minded political movements, inspired in part by the Darwinian thought that began to sprout at the time. Nineteenth-century animals may not have been the heroes of their own lives but, as Kreilkamp shows, the history of domestic pets deeply influenced the history of the English novel. Ivan Kreilkamp is an Associate Professor of English at Indiana University, where he is co-editor of the journal Victorian Studies. He is the author of Voice and the Victorian Storyteller and Minor Creatures: Persons, Animals, and the Victorian Novel, and is working on a short book about Jennifer Egan’s A Visit From the Goon Squad for Columbia UP’s new Rereadings series.